War Grave Register notes: CROZIER, Tpr. Richard Walters, 930. 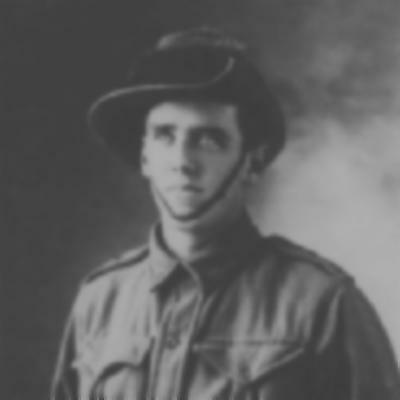 6th Australian Light Horse. Killed in action 4th Aug., 1916. Age 24. Son of Thomas and Hannah Crozier, of Culcairn, New South Wales. Native of Numurkah, Victoria, Australia. B. 34.
cemetery records Parents: Thomas and Hannah CROZIER, Culcairn, New South Wales. 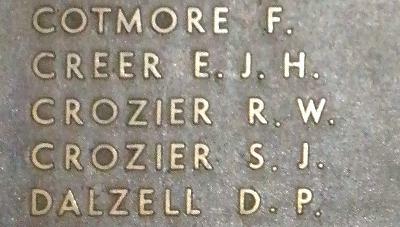 Family/military connections Brother: 759 Pte Sydney James CROZIER, 6th Light Horse Regiment, died of wounds, 29 March 1918. Taken on strength, 6th Light Horse Regiment, Gallipoli, 2 October 1915. Wounded in action, Gallipoli, 25 November 1915 (gun shot wound, neck); admitted to 3rd Field Ambulance, 25 November 1915; transferred to 1st Australian Casualty Clearing Station, Gallipoli, 25 November 1915; to Hospital Ship, 25 November 1915; disembarked Malta, 3 December 1915; admitted to St Elmo Hospital, Malta, 3 December 1915; to Ghajn Tuffieha Camp, 22 December 1915; found guilty, 8 January 1916, of disobeying an order: awarded 7 days Field Punishment No 2; discharged, 26 January 1916; embarked for Egypt, 26 January 1916. Rejoined unit, Maasi, 8 February 1916. Taken on strength, 2nd Reserve Regiment, Maadi, 1 March 1916. Transferred to 6th Light Horse Regiment, Tel-el-Kebir, 30 Apirl 1916; rejoined unit, Romani, 13 May 1916. Killed in action, Et Maler, 4 August 1916.